Chicago based Groupon which started selling its daily deals in Canada on April 19 in Toronto and on April 26 in Vancouver has hit the $2.5M in gross revenues as of yesterday. 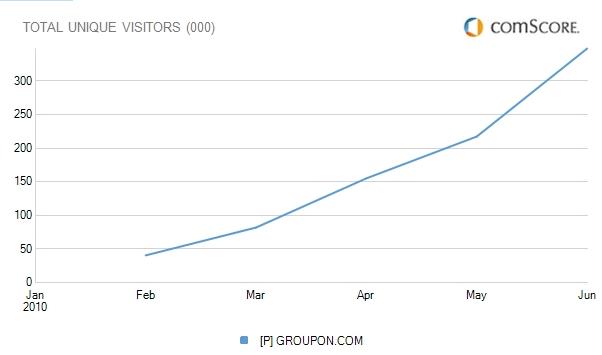 Back on June 20th I posted that Groupon hit $1M in Gross Revenue, marking a acceleration in revenue. NOTE: This is according to my tracking document and not an official release from the company. Toronto represents 44% of their Groupons Sold, while Vancouver respresents 56% of total units sold. This is quite a major shift from my post in June 20th, when Toronto represented a larger share of the units sold for Groupon. In terms of gross revenues, Toronto is 46% while Vancouver is at 54% of gross revenue. In terms of savings to consumers – Groupon has saved consumers $4.6M during this time. In terms of traffic growth, as reported by ComScore, they started to register in February of this year and are a good upward trend, breaking the 300K UV mark in May. What is great news for Canadian consumers is that Canada’s largest deal site, RedFlagDeals.com is launching a daily deal service very soon. This entry was posted in daily deals, Groupon and tagged daily deals, Groupon, redflagdeals.com on August 5, 2010 by Darby Sieben.